The Denver Nuggets entered Tuesday with a 0.5-game lead over the Golden State Warriors for the No. 1 seed in the Western Conference. And on Tuesday night, the Nuggets got to host the Warriors at the Pepsi Center, with the opportunity to show that they’re for real and a legitimate threat to Golden State. Well, a statement was indeed made… by the Warriors. 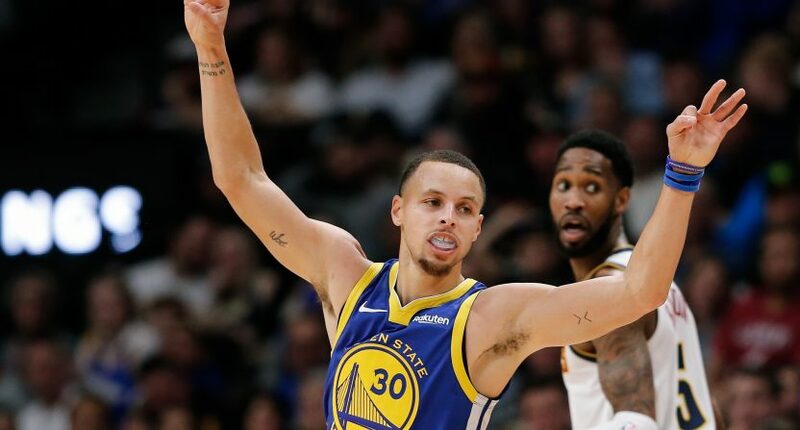 Golden State blew out the Nuggets 142-111, and the dismantling began with a 51-point first quarter, the highest-scoring first quarter in NBA history. The Warriors have said all along that the regular season is all about prepping for the playoffs — not to get too wrapped up in any win or loss over first few months. But they are enjoying this one — reminding the Nuggets and the rest of the league just how dominant they can be. The Warriors shot 60% from the field and were particularly lethal from three-point range, where they made 21-of-39 shots (53.8%). Steph Curry (31 points, 8-of-13 on 3s), Klay Thompson (31 points, 5-of-8 on 3s), and Kevin Durant (27 points, 5-of-7 on 3s) all scored at least 27 points and had at least five three-pointers. There’s been talk about the Warriors being more vulnerable this season, but odds are it just appears that way because Golden State hasn’t cared about winning early-season games as much as everybody else has. Their main goal is — regardless of what they tell the media — to get into the playoffs healthy, and should that happen, they know they’ll be the team to beat by a wide margin. The Warriors — winners of five straight — have an unfairly quick turnaround and travel situation, with a home game against the New Orleans Pelicans on Wednesday night. It will be interesting to see how Steve Kerr distributes the minutes and if he gives any of the stars a night off.